Have you ever seen the blockbuster movie Gone in 60 Seconds, in which high-end motors were stolen in a matter of seconds? Whilst most of the car-boosting techniques were a little far-fetched, rapid and sophisticated car theft is fast becoming a concerning reality. High-end cars from premium brands like BMW, Range Rover and Mercedes-Benz are disappearing overnight right from their owners’ driveways – without the keys. Back in the early 90s, car theft was rife and motorists would often return to discover their pride and joy was no longer in the spot they parked it. A lack of anti-theft security made it very simple to start and drive a car without a key. Illegal methods known as hotwiring could see a brand new car stolen with very little effort. Insurance companies began demanding improved security measures, and in an attempt to reduce car theft an EU law was passed in 1998, demanding all new cars be factory-fitted with an immobiliser. Cars now fitted with Thatcham approved immobilisers are much more difficult to start without a correctly programmed key and thieves have been turning to new methods for stealing cars. So if cars are now fitted with secure immobiliser technology, how are they still being pinched without the keys? Well, the short answer is thieves are making their own keys – in seconds! Using highly sophisticated technology that plugs into the OBD (On Board Diagnostic) system thieves are able to program a brand new key and start the car. This is a really big problem with BMW cars in particular, and hundreds have been stolen using this technique. The laptop-based key programming equipment was originally produced for garages and mobile locksmiths to produce replacement car keys when car owners lose all their keys. Another standalone tool exists that simply plugs into the OBD port and codes a key at the push of a button in a matter of seconds. Unfortunately, these tools have ended up in the wrong hands and are being used to unlawfully take high-end cars. There have even been reports of cars being stolen without the use of this high-tech equipment. How can this be happening? 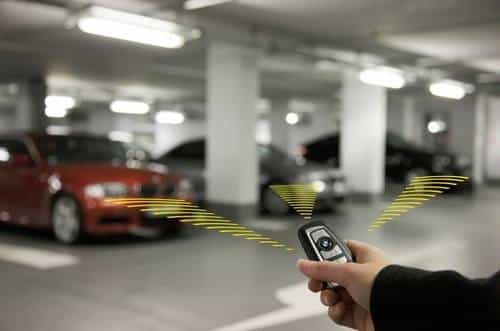 For the majority of car manufacturers should you lose your car keys a replacement key would need programming to your car, but this is not the case with some BMW and Mercedes-Benz vehicles. When the car is first produced, a total of 10 keys are programmed and held at the factory as replacements in case the keys are lost. These keys are ready-programmed to start the car. Thieves are very aware of this and have been going to great lengths to fake identification and walk into car dealers and order themselves a key to the car of their dreams. Another car theft problem exists with the latest Toyota and Lexus proximity keys. Crooks have been using a sophisticated tool that clones the signal of a key when pressed to lock the car. The thieves hide out of sight and press a button on their cloning machine at the same time the car owner pushes the key lock button. The signal is then copied and allows the thieves to unlock and start the car without any sign of break-in. What can be done to prevent your car from being stolen? BMW is now aware of the problem of “key cloning” and has been working on a software update solution for the cars affected. A free software upgrade is being offered by BMW to prevent the key cloning and secure the vehicles. Be careful what you do with your keys and who you give them to. Keys can easily be cloned and copied – do you fully trust that parking attendant? When you lock your car with the remote key pull the handle to ensure it has actually locked. Thieves are using tools that block you remote and leave the car unlocked so this is really important. Never leave your keys near the front door or on the stairs, they can easily be hooked through the letterbox. Smart proximity keys are programmed through the OBD port, think about moving the port to a hidden place. It would seem strange that it took longer to pinch a car in 1990 than it does today. How secure really is all this new anti-car theft technology? Carlo Casta writes for The Car Expert on behalf of replacement car key specialists The Car Key People, who make the task of replacing your car keys as headache free and simple as could be. We’ve just had our brand new range rover sport (new model) stolen off driveway without keys. Very interesting article- don’t seem to hear much about this in the press. It was recovered thanks to the tracker, but what’s to stop this happening again. Any ideas on getting Land Rover to take the security issue seriously- they are saying it is nothing to do with them!! I have had my bmw 335d stolen from the drive using the obd technique. Thieves broken the window on the driver’s side and used the obd to drive off with the vehicle with both keys still in my posession. Unfortunately i had no tracking device on and when I went into stratstone for my services I wasn’t even made aware of this issue for me to take steps towards it. Nthe vehicle has not been recovered. The interesting thing is that the alarm did NOT go off when they smashed the glass. Interestingly, when i spoke to an independent company because bmw did not bother replying to my email, it has become apparent that the alarm doesn’t go off unless the door is opened. BMW never warned me let alone offer the free software upgrade which it allegedly provided. Can this be pursued legally? Thieves tried to steal our Range Rover Sport but we had a cat 5 Trackstar and ODB isolator fitted by Select Auto Systems. We watched it on our cctv absolutely shocking but at least we still have the car. Hi Carlo or whoever now writes these articles. I am a student in my final semester of a degree program and my thesis is dealing with Data Mining. I attend school in an area close to a border and the theft of cars are rampant. I intend to show how data mining in tandem with CCTV footage can be used to prevent the theft of cars and improve the chances of recovery by providing a kind of grid security network. I have an idea and would love to speak to one of your experts about the possible implementation of my plan.